Simplifying a Reader’s Paper-Clutter Mess! An anonymous reader sent photos and questions about her bedroom. I answered the laundry portion of her questions yesterday and today I’m offering tips for how she can organize the rest of her room! Problem 5: The “bedside table” is actually a dining room table we weren’t using…it’s my mom’s. She passed away last year. Solution 5: I’m so sorry to hear about the loss of your mother. I completely understand wanting to hang on to some things to honor and remember loved ones. Since it’s currently being used as a “clutter catcher,” I suggest finding a more fitting home for this table. Can it be used as a coffee table, or replace your current dining table (and your current table be sold on Craigslist), or can it be used as a desk or craft table in another room? The current location doesn’t seem to be the best place for it, but I know that having some sort of table or shelf in your room is necessary. If you sell something else you don’t need, such as your kids’ consignment clothing, you could probably purchase nightstands without needing to dip into your regular budget. BONUS TIP: Unfortunately, newer “wood” furniture is often made out of particle board that will fall apart within just a few years. It’s usually better to find quality items at consignment stores or on Craigslist. Problem 6: I need to keep my paperwork until I can sort through it, and I’m not sure how long I need to keep each type of paper. I don’t really have another place to put this. I’d love advice on a semi-permanent way to organize this. Solution 6: I found the perfect free printable for you! It’s from Clean Mama, and it’s beautiful and functional! The shred and throw away piles are for stuff that you quickly know you don’t need to keep. Get those out of your house ASAP. This will help get your paper piles down to a much more manageable level very quickly. BONUS TIP: Do NOT spend a lot of time deciding which papers to toss and which to keep – if something is a tough choice, immediately put it into your “sort later” pile. This will keep you from getting bogged down on something so you can stay focused on the big picture! As far as the papers that you’re keeping to sort through later, just put them into boxes, plastic totes, a filing cabinet, or pretty baskets. Who cares if they’re not organized perfectly yet – those papers don’t need to stop you from having a lovely bedroom! Problem 7: I can’t seem to keep surfaces clean. It’s part of the reason my husband doesn’t want to get a lot of shelves. I understand that. However, not having places to put things doesn’t make the things go away. What would you suggest? I’m thinking some sort of cupboards, because that would hide the stuff. Or some organizers with lots of drawers. 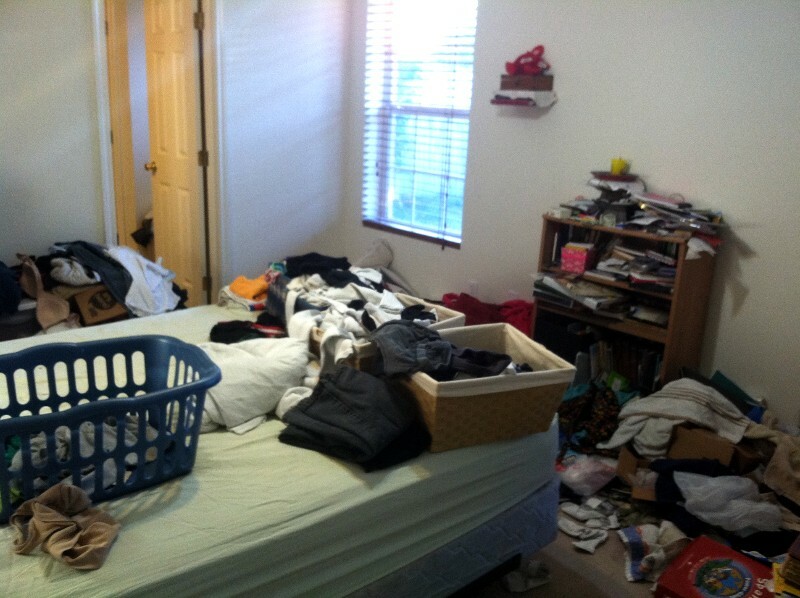 Solution 7: I think that if you work really hard to declutter your bedroom and discuss it with him again, he may agree to a shelving solution that would work for both of you, especially if you have a plan of exactly what is going to go on the shelves. Both of your ideas sounds great, or maybe even a sturdy bookshelf with some pretty baskets in it to hold different groupings of things. A great place to start, shelving-wise, would be by using the bookshelf and baskets you already have in your room! SPECIAL NOTE: For more frugal storage solution ideas, check out this post about how I decluttered and organized my entire house without spending a dime! What tips or advice do you have for organizing this room? Support this reader in the comments! 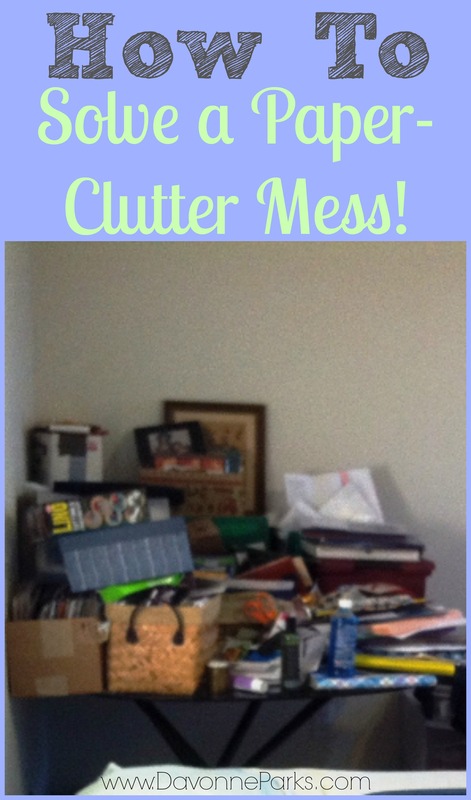 And don’t forget that if you submit your own mess, you’ll receive a free copy of Chaos to Clutter-Free, plus you’ll be entered into a drawing to win a $50 Amazon Gift Card! Details and submission information are here. « Solving a Reader’s Real-Life Laundry Mess! Well, I’ve started on this at least. It doesn’t look any different so I’m not sending a new picture yet, but I did get several inches papers sorted and one inch of papers thrown away. A small step, but it took me 2 hours. Still, I know it has to be done, so, it’s a start. That’s a wonderful start! Thank you so much for the update – you’re doing awesome!